The Motor Traffic and Transport Department (MTTD) of the Ghana Police Service, has instructed the Greater Accra regional MTTD command to deploy more men to the Adenta-Madina-Aburi road to check over speeding and other road offenses. The directive follows the increase in road accidents on that stretch which has largely resulted in deaths. “So, with immediate effect, I am instructing the MTTD to do so because we don’t have to wait for more lives to be lost due to over speeding. This is what we are doing to check the drivers, he noted. Member of Parliament for Adenta, Yaw Buaben Asamoah, has said Government’s plans are well advanced to ensure that more deaths on the Adenta-Madina stretch are prevented. According to the Member of Parliament, he is unhappy over the highway carnage happening in his constituency. He said, he is not happy and is deeply sad and worried about families who have lost their loved ones on the road. Speaking in an interview on Citi TV’s Face to Face, Mr. Yaw Buabeng Asamoah said he is as frustrated as residents of Madina and Adenta over the neglect of the uncompleted footbridges. According to the Member of Parliament for Madina, Alhaji Boniface Saddiq Abubakar, the Ministry of Roads and Highways is in talks with the contractor of the Madina-Adenta highway to return to the site and complete construction of the footbridges. But Saddiq Abubakar said the contractor will return to the site following the payment of arrears owed him. Residents of Adentan have been protesting the lack of footbridges on the road. They have vowed to embark on a demonstration this week over the unavailability of footbridges on the highway. 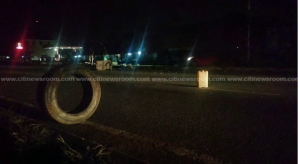 The post Police deployed to maintain order on Adenta-Madina-Aburi road appeared first on Citi Newsroom.